Black Friday Event with Global Youth United! #GivingTuesday is a day for everyone, everywhere to GIVE! If you are thinking about making a donation on #GivingTuesday, please consider giving to the Tri-City Storm Soccer Club. Your donations make it possible for youth of the Fargo, Moorhead, West Fargo and surrounding communities to stay active, make friends, and enjoy the wonderful sport of soccer. Through our partnership with Global Youth United, TC Storm has been able to provide playing opportunities, transportation, equipment, meals, and much more to hundreds of youth in the area. 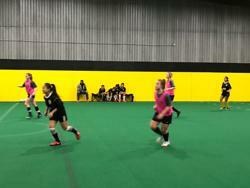 TC Storm just hosted a Black Friday event for our Select members and the youth of Global Youth United. No admission was charged, however, we asked for goodwill donations of gently used winter clothing (hats, gloves, scarves) for the New Life Center, as well as soccer equipment which will be distributed to soccer players of Global Youth United and those in the community who couldn’t otherwise afford it. This event was a great way to bring the community together to enjoy friends, family, soccer, food and music! Thank you to all who brought in a donation and participated in a fun filled day. TC Storm has in the past and continues to plan on offering these events in an effort to give back to the community that has provided such generous support to us. These events are just one small example of how TC Storm uses the donations received. The TC Storm Board of Directors, management, and staff, thank you for your involvement with the Tri-City Storm Soccer Club and for considering a donation to our organization. Thank you to all who have donated and to those who will donate in an effort to allow the youth of our great community to pursue their dreams! Lastly, thank you to our wonderful community sponsors who have demonstrated continued support throughout the years in our efforts to help grow soccer in our community.